Stop by Farmers Coop and shop our expanded pet food department, for premium pet foods such as Victor and Diamond. We’ve added to our selection of pet foods to include formulas for every pets needs. So whether your dog is an athlete, an aging adult or your fuzzy, furry baby, rest assured at Farmer’s Coop , we’ve got a pet food formula that’s perfect for him. If your fur baby goes meow, we’ve got new formulas of food for her too! Check out the following brands of dog and cat foods at a Farmers Coop near you. Selection may vary by store. 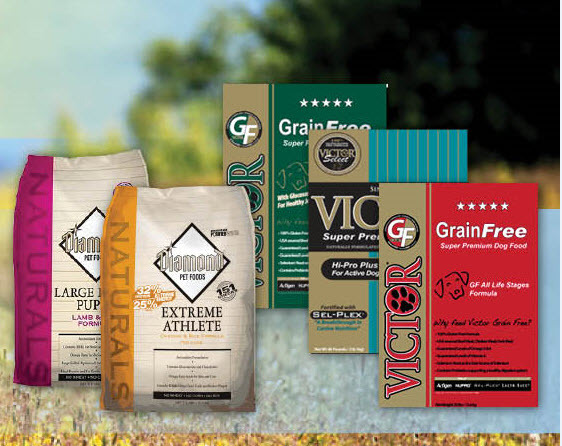 Victor – All formulas are free from corn, wheat, soy, gluten, or any other processed grain by-products. All contain scientifically advanced ingredients that work together supporting a strong immune and digestive system. Victor is a brand that is manufactured in Texas. Diamond – Formulas are made with the highest quality products and manufactured in America in state-of-the-art facilities. With carefully determined levels of protein, fat and other essential nutrients, Diamond pet foods are formulated to enhance the performance, appearance and overall health of your pet, day after day. SportMix – Delivers great taste, digestibility, and 100% complete and balanced pet nutrition. This special balance of protein, fats, vitamins, and minerals supplies the essential nutrients needed to promote strong muscles and bones and a glossy skin and coat. Hi-Point – Hi-Point Pet Food is made from real food ingredients. To ensure this, food that you get from Hi-Point is sourced directly from real farmers! Proudly made in Oklahoma! Looking for pet supplies, we have those too! Farmers Coop offers a large selection of supplies sure to please your pet. Check out our selection of leashes, collars, toys and more. We’ve also got bedding and shavings to keep your animals dry and comfy. Stop by your local Farmers Coop for pet food and supplies. We look forward to seeing you! This entry was posted on Thursday, July 26th, 2018 at 6:46 pm	and is filed under News & Updates. You can follow any responses to this entry through the RSS 2.0 feed. Both comments and pings are currently closed.